There is a regular programme of temporary exhibitions of manuscripts in the Wilkins Room, which is open to all members of College. Please contact a member of the Parker Library staff to arrange a visit. The Parker Library is also open to the public every Monday and Thursday afternoon. Tours leave from the Tourist Information Centre at 14.00 and last one hour. This includes a visit to both courts, the college chapel, and the Parker Library. Tickets should be booked in advance by phoning 01223 457574 or online. On the first Thursday of each month, the St Augustine Gospels are displayed. 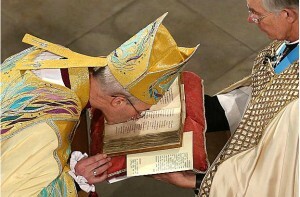 They are seen here being used in the recent enthronement of the Archbishop of Canterbury. The Parker Library will be open for the annual Open Cambridge event in September.